Visit the largest necropolis of Sardania of pre-nuraghic age, named as Anghelu Ruju. Located near Nuraghic village, this historical site is a worth visiting place. History says, the site was accidently discovered in the year 1903 during the excavation for the construction of the farmhouse winery of Sella & Mosca. After the first appearance of this site, the excavation continued till 1967. It is said that nearly 37 underground burial chambers were discovered. 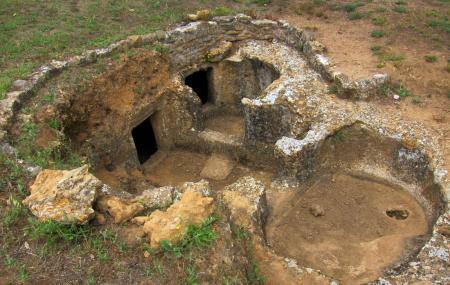 These chambers said to be the example of “domus de janas”, in other words, “houses of fairies”. Numerous findings like belongings from Copper Age and the Bronze Age were found from the site. Replicas of some of these finding are kept in the Museo e Tenuta Vitvinicola. Features to check: the symbols of bull and horns sculpted on the chamber tombs, it walls and pillars. You can visit the site in the morning hours as well. Entrance + guided tour - 5€. Educational tour - 4 €. Educational Tour: 1 and ½ hour. How popular is Anghelu Ruju? People normally club together Sea Walls and Spiaggia Torre Del Porticciolo while planning their visit to Anghelu Ruju. History goes back a long way. A visit that takes you back a bit. Impressively old. Good explanations in 5 languages. Great that one can enter all graves. No shadow and very hot. Worth visiting. Bring a flashlight. Awesome necropolis with more than 30 tombs.